304 Stainless steel heavy duty stainless steel welded C frame. All contact parts are stainless steel, sanitary, Teflon, viton and hoses per your requirements. Special seals or hoses by order. Calibrated guide for fast height changeovers. Leveling of machine by 1" steel leveling screws. Omron PLC for all machine logic functions, special modifications on programs available for special adaptations. Front panel conveyor speed control for machine sold with conveyor. Front panel Start and Emergency STOP for easy access. Front panel nozzle code for changing nozzle quantities. Fibre-optic sensors by Omron standard for container gating. 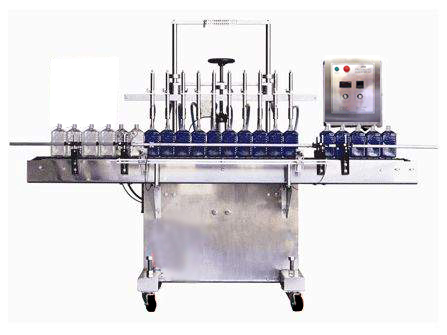 No bottle no fill PLC controlled. Piston filling and charging stroke by power full 6 inch bore air cylinder. Air over oil application on principal air cylinder to create a smooth and constant filling speed. Main pistons support mounted and guided by Ball profile rails and carriages to create a smooth, silent and accurate filling and charging movement. Hardened Stainless steel calibrated shafts with linear bearings for nozzle rack movement smoothness and durability. 8 inch stroke air cylinder with magnetic sensors for nozzle up and down movement. Hand wheel and shaft mounted stoppers for height and stroke adjustment. Hand wheel counter mounted on volume control threaded rod. Nozzle spacing fully adjustable through top or bottom screw. Container height adjustment from 1 to 16 inches high. Color coded flow control valve for filling speed. Nozzle stroke adjustments from 0 to 8 inches. Entry and exit bottle gating cylinders adjustable, sideways, up and down and inside and outside. Will work with plastic, glass and metal containers. No change parts needed for various types of containers. Air filter-regulator and safety lockout valve included. Spacing and additional bottle control obtained by flow controls mounted on air gating cylinders. Electric & pneumatic requirements : 110 Volts, 60 Hz, 15 amp. : 20 CFM @ 80 p.s.i.